Do you see ads labeled Ads by PassShow on your machine? Then you got the PassShow adware installed. You may also see pop-ups from the gld.pathticket.net web site. PassShow is pretty easy to delete with FreeFixer. The following removal instructions will remove PassShow from Internet Explorer and Mozilla Firefox. Check 150.dll, PsUp.exe and 150.xpi for removal in the scan result, as shown in the screenshots below. How did you get PassShow on your machine? I found it while testing a download from CNet’s Download.com site. There’s also a Shopper-Pro entry in the Add/Remove programs window in the Control Panel. I found ShopperPro bundled with a free download. 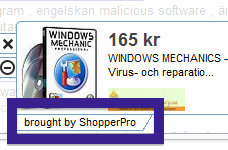 Where did you find ShopperPro? Did you also find it packaged with another download? Just a quick update. I’ve just uploaded a small removal tutorial for the iWeBar software. If you have the iWeBar installed on your machine, you’ll probably see iWebar-bg.exe running in the Windows Task Manager and ads labeled “Powered by iwebar” in Chrome, Firefox and Internet Explorer. There’s also a bunch of other iWeBar files that will be run by the Windows Task Scheduler that appears in FreeFixer’s scan result. Update 5th November: The iWebar adware is still distributed. Now the iWebar files are digitally signed by Gogo Network Club. 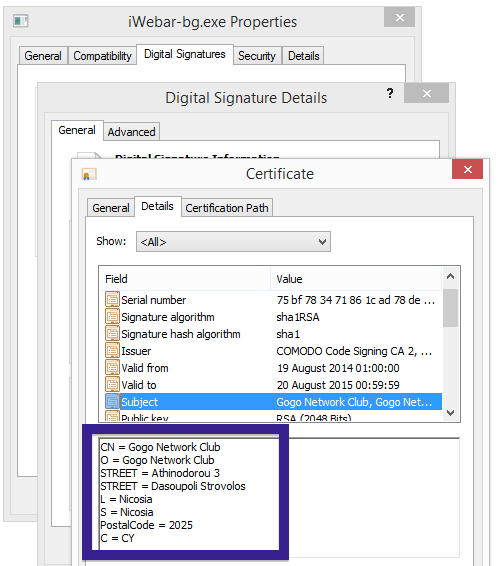 According to the embedded certificate Gogo Network Club is located in Nicosia, Cyprus. Are you getting ads labeled “Powered by Object Browser” or “Brought by Object Browser” while browsing sites such as BestBuy, E-Bay, Walmart or Amazon? 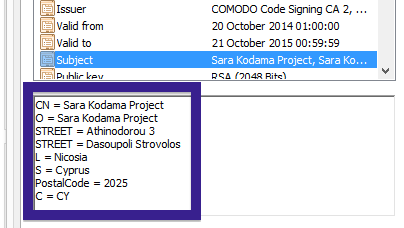 Update 2014-11-13: Now the Object Browser files are digitally signed by “Sara Kodama Project“. 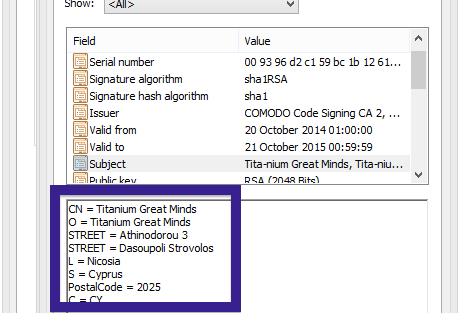 Update 2014-11-19: Now the files are signed by Tita-­nium Great Minds. Tita­nium is also located in Nicosia, Cyprus. Update 2014-12-19: Now the files are signed by Armageddon Labs (BrightCircle Investments Limited). Found another bundled piece of software today called FreeSoftToday. It opens up a pop-up with free software offers. How To Remove Albrechto Ads, Deals and Coupons. Found another variant of the WebCake adware called Albrechto. As usual it is bundled with free downloads. If you have Albrechto on your machine, you will see an extension listed in Mozilla Firefox and AlbrechtoBHO.dll loaded into Internet Explorer. Albrechto can be uninstalled from the Add/Remove programs dialog. Yesterday I found another adware program called BrowseSmart. 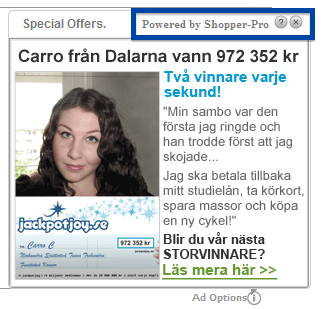 BrowseSmart can show various types of ads. During my testing it added a frame on the left side of the web browser window with “Related Searches“. 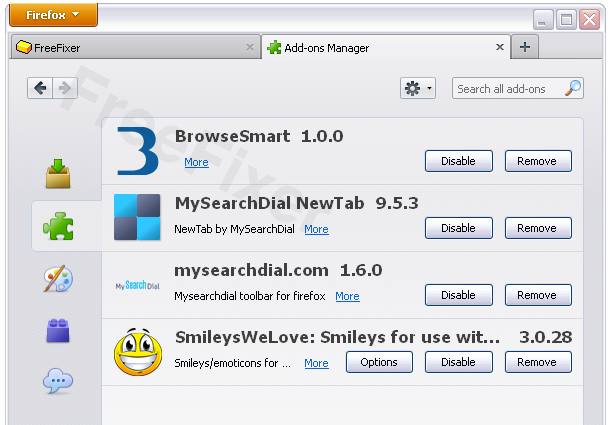 BrowseSmart is bundled with free downloads. I found it in a program called “File Extractor”. The screenshot also explains what types of ads BrowseSmart can show. You will also see BrowseSmartBHO.dll loaded into Internet Explorer. 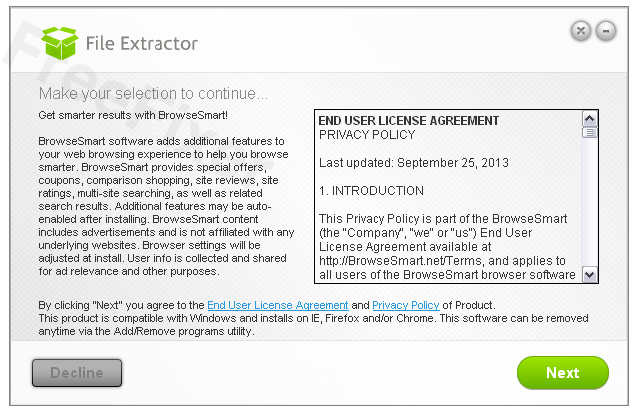 BrowseSmart can be uninstalled from the Add/Remove programs dialog. Sorry for not posting or doing any work on the FreeFixer program for the last month. Due to some unexpected events I’ve spent the last 30 days in the hospital with my new born son. Luckily everything is under control and the three of us are back home. Today I found an adware program called Outobox. It is bundled with downloads from CNET. 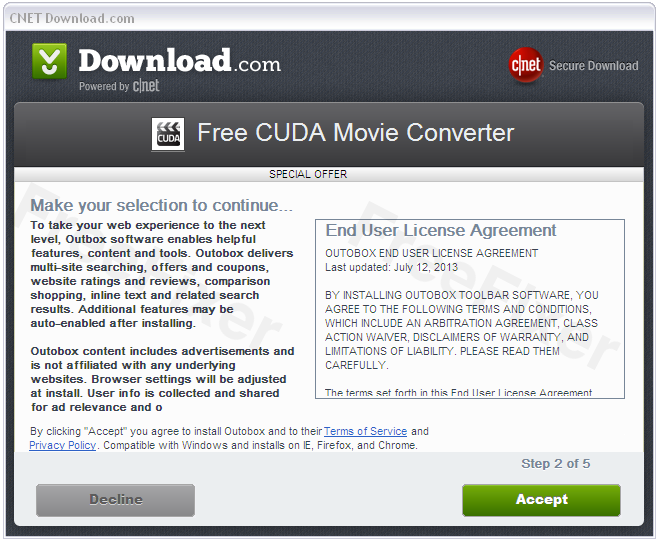 The Outobox Terms and Conditions describes the Outobox functionality as shown in the screenshot. Outobox can show many types of ads, such as search ads, banner ads, text ads, etc. 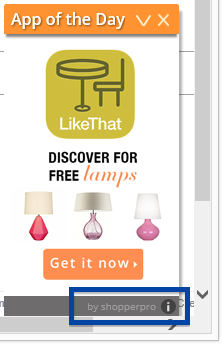 Unfortunately I’ve not managed to trigger the Outobox ads on my lab machine, therefore no screenshot of the actual ads. I assume the ads are labeled “Outobox”. Do you see the Outobox ads on your machine? Please send a screenshot and I’ll update this blog post. 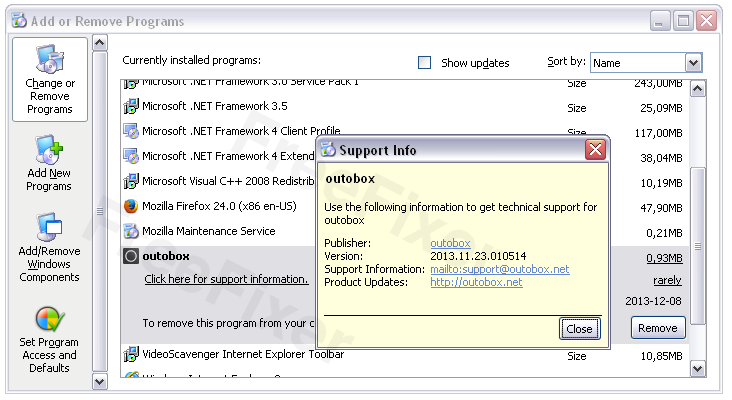 If you have Outobox installed on your machine, you’ll see the Outobox Extension listed in Firefox, Chrome and Internet Explorer. You’ll also see outoboxbho.dll loaded into Internet Explorer. Removing Outobox is easy. Just uninstall it from the Add/Remove programs dialog. If the removal fails you can remove Outobox with FreeFixer. Please let me know what you think about Outobox by posting a comment.